We had a great tour sharing the Body Protection program and benefits. Athletes, doctors, physical therapists, and coaches were able to learn the various movements of www.BodyProtection.com. We will now be in Florida for a couple of months training and coaching. Hope you all had a great summer of training, racing, and competing! What Physically Makes The Best Athletes? When we watch professional sports, the ability of an athlete to rapidly accelerate and then quickly decelerate over and over is one of the elements that separates the best from the rest. The myth that the person with the largest muscles creates the best athlete is put to rest when observing a wide variety of sports. The person with the ability to have the strength, stability, and explosion to perform these movements at the world class level is physically the best athlete. The traditional “body building” training will actually diminish the accelerate/decelerate abilities. Strength/endurance foundations and proper speed/explosion movements will improve the skills of these professional athletes. 2013 Body Protection Tour will finish in the Middle East. There is a slight change (due to the Embassy closings around the world) as we reduced the four-city stop to three. We will be in Dubai, Abu Dhabi, and Manama until early September. The 2013 Body Protection Tour is finishing its New England portion of the tour. We had a great week in MA training tennis and lacrosse players. 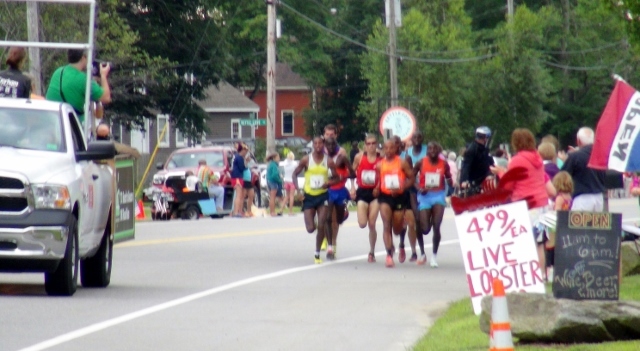 This morning we attended the Beach to Beacon road race in Cape Elizabeth, ME as Kogo went on to win beating Kipruto by 4 seconds. The top four finishers were all from Kenya and Americans Keflezighi, Krause, Hall were 5th, 6th, and 10th respectively. Our 4-city tour of Dubai, Abu Dhabi, Manama, and Muscat could be jeopardy later this month with the new travel warnings and Embassy closures due to possible terrorists threats. We will make a final decision about our travels to the Middle East in the week of the 19th. The Body Protection Tour made its way to the northeast United States as I trained with Upper Valley Running Club and the Lebanon High School cross country team and then finished with a speaking presentation nearby Dartmouth College at the Howe Library in Hanover, NH. It was great to work with many members of the Upper Valley Running Club on Tuesday night and then pacing the top Lebanon high school runner on Wednesday morning in a 2 mile tempo run (photo below). The 2013 Body Protection Tour began in Europe in Scotland (Glasgow and Edinburgh) and Northern Ireland (Belfast). It was a great start to our 2013 adventures as we visited places we have not been before. The photo below is after the Body Protection workout at the Marriott Glasgow on route to catch Andy Murray winning Wimbledon at a boisterous Scottish pub – great fun! We now travel to New England for a talk in Hanover, NH. The “Body Protection” presentation will take place on 7/24 at 7pm at The Mayer Room at the Howe Library. Feel free to come by if you are in the area, it will be free of charge. For more information, please visit https://www.teamamp.org/content/july-24th-2013-summer-speaker-series. I will also be attending a track workout at Dartmouth College the night before on 7/23 to meet some of the local runners. Come out and say hello and join us in a speed workout! Then it will be onto Massachusetts and Maine before we do a 4-city tour of the Middle East in August. I am turning the BIG 50 on Wednesday. I received my first AARP card in the mail this past weekend – so it is now official. I remember when I was a kid and I asked how old some of my parents’ friends were and they told me “50.” I thought, Gosh that is old! However, now that I am on the doorstep of 50, my perspective has changed and it does not feel that “old” after all. We here at www.OneMileRunner.com have decided to choose a few of my favorite races to compete in this year. It will all begin next month in Austin, TX. To prepare for the event, I topped off another 30 mile week of running with 5 half-mile quick repeats on the road. Next Saturday, feel free to join us in Sarasota for a one-mile time trial, point-to-point, for a “dress rehearsal” to see what we need to sharpen upin our last month of training. 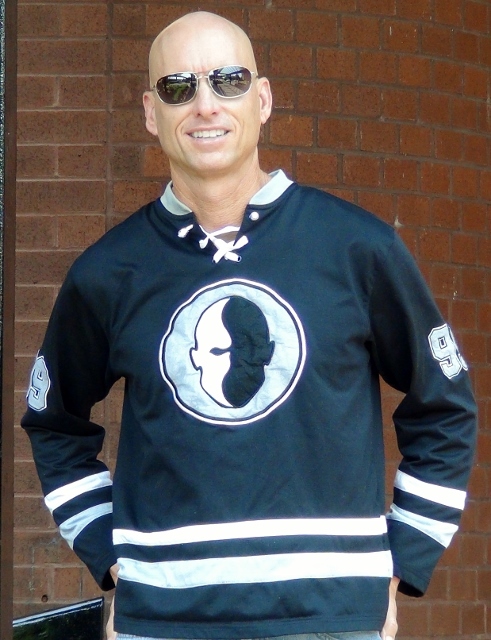 As I turn 50 years old in less than one month on April 10th, it is time to announce my first race for 2013 – The Congress Avenue Mile in Austin, Texas on May 18th. It was the second race in my 20/20/20<5@45 event back in 2008. I won the Masters Heat (over 40) in 4:50 at 45 years old. I have begun training now to try to beat my time of five years ago. Racing the mile faster five years later at 50 would be a great way to kick off the racing season. In 2013, I will be returning to some of my favorite races around the country. We travel to Texas first. Our training concentrates on first establishing a running and strength base. In the photo above, we destroyed one of my 6 pound medicine balls on aggressive throw downs in the strength portion of the workout. As in the past, I put in 30 miles a week with each day being a different distance and theme to race one mile well in May. While the northeast was clearing out from the record snow fall, we were finishing up our first week of training with 7 x 1/4 mile on the incline of the Ringling Bridge in 75 degree weather. In speaking to family and friends up north, they were all having fun in the snow. To each their own as I am happy to be running and training in the Sunshine state. In my last blog post, I spoke about the importance of landing stiffly on your foot pad when sprinting to decrease your time on the ground and thus becoming faster. Many runners have a difficult time with this stiff landing and the explosive push off because they do not yet have the strength in their lower extremities to run like this for very long. 1) Work your way up to the Speed and Explosion segment of Body Protection, at www.BodyProtection.com. All the explosive movements are done on your foot pad as you can only stay 1/4 of a second on the ground. Very difficult to do, but worthy of trying as you build your legs for speed, stability, and power. Remember that I maintain my stiff landing throughout my mile competition. Months of strength, explosion, and speed training needs to be done in order for you to depend on your sprint and power form. I will be announcing my first race in 2013 in my next blog post. All the best with becoming your best! 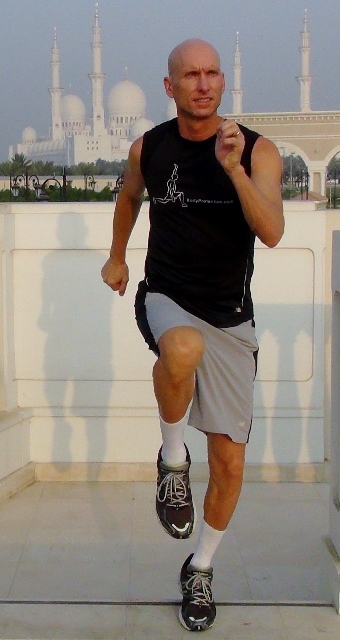 Most people discuss the two most common ways to run faster by increasing stride frequency or increasing stride length. However, I feel the key to running faster is landing stiffly on the pad of your foot. The more time that you spend on the ground, the slower you will go. It is simple – fast running is not done on the ground but in the air. If you have not worked your entire body to incorporate speed and explosion, you will not perform very well or you will get injured. When I am running faster, my foot lands stiffly on my foot pad (the area between the toes and the arch of your foot). This area is commonly referred to as the “ball of the foot” which has a fatty pad that protects the five metatarsal heads and provides a nice cushion when you land. When you run fast you are putting 100% of your body weight on this specific area. When I say landing “stiffly,” I mean that my heel does not hit the ground. I am trying to reach out in front of my body as far as I can and still land on the foot pad; thus , decreasing my time on the ground. Landing on your heel is like putting on the brakes due to your leg being straight and spending too much time on the ground. A variety of injuries (from your foot to your back) can occur if you continue to land on your heel. Once I land on the pad of my foot, I explode forward and up with almost a bounding feeling. The best way to find out how you land is to take your shoes off and run. 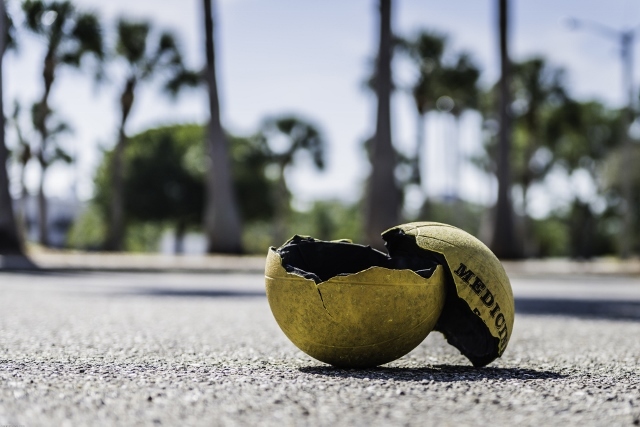 See if you land on the ball of your foot, your heel, or flat. A soft flatter landing (still hits the foot pad first but allows the heel to touch) is good when running slowly and with a shorter stride length as you do not want to run with a stiff landing unless you are elongating your stride length. 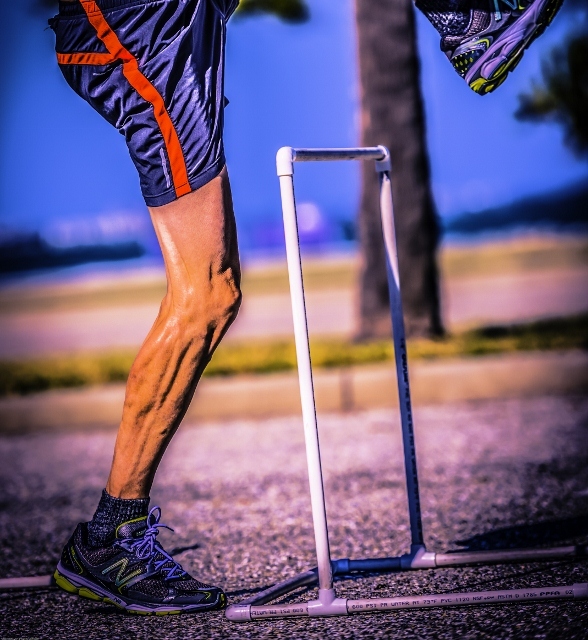 If you continue to land stiffly with a short stride length, this will create a sheering effect as your femur pushes down in front of the tibia creating knee pain. Please spend time strengthening all your muscles, ligaments, and tendons (especially in your legs and feet) before trying this stiff foot pad landing. 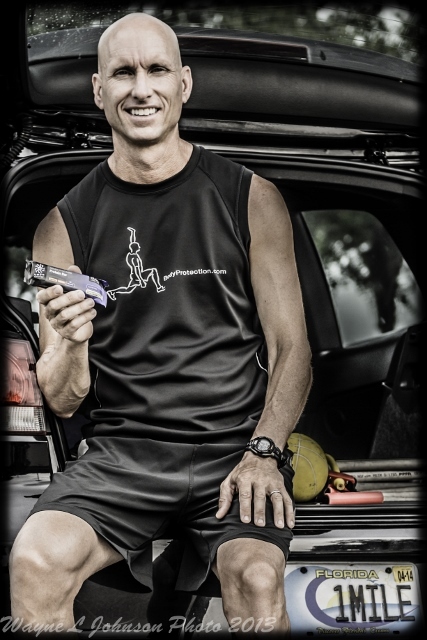 Please visit www.BodyProtection.com for your copy of the exercises and movements to create the strength you need to become an explosive, fast runner.